Restaurant bashing has become a very public sport, but you'll seldom hear the other side of the story. 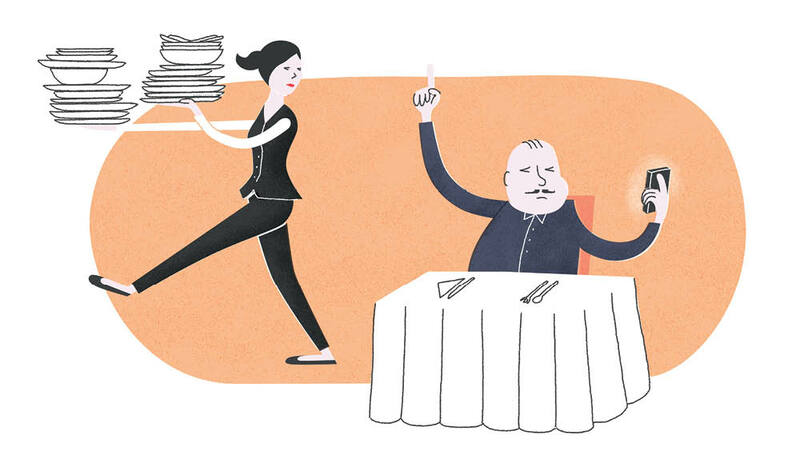 Because there’s no customer equivalent of TripAdvisor, Leanne Clancey turns the tables to let hospitality pros dish the dirt on bad diners, and they have three things to say: communicate; be kind; and for crying out loud, put your phone away. Since the media (and ergo, the world) became obsessed with food, it seems like every second grandma and school kid is laminating chocolate and sous vide-ing their venison. But while our levels of gastronomic sophistication might be at an all-time high, elsewhere our food experience is lagging. When it comes to being a good diner, it seems we’ve forgotten our manners. Thanks to review sites like TripAdvisor, if you’ve got a gripe about your tripe, it’s game on. Restaurant bashing has become a very public sport, but you’ll seldom hear the other side of the story – that is the tales of inconsiderate, rude and downright reprehensible behaviour that diners routinely dole out to restaurant staff. Melbourne-based food critic and former waitress, Larissa Dubecki chronicled the horrors of poor customer behaviour in her 2015 memoir, Prick with a Fork. In it she says: “There seems to be this psychological thing that once you are at a restaurant for a few hours, you have the right to this slave for the night and that slave doesn’t deserve basic human civility.” It’s a shameful reality that most hospo pros will back up. Other biggies? Stacking plates or handing plates to servers while they are clearing the table (waiters have a system for this, please let them do their job). Paper napkins stuffed in glassware (just gross). Fussy eaters and allergy fakers. Customers who voice complaints online when the issue could have been easily resolved with staff in the restaurant. There’s also a loss of presence that comes with being a phone-addict: Instagrammers, Tinder swipers, alpha males doing deals, silent couples scrolling their way through multi-course degustations. Then there’s the straight-up abuse that restaurant staff endure on the job. Rudeness, arrogance, aggression, racism and sexism are all part of the territory, and yet a waiter’s role is to grin, bear it and always, always apologise. For anyone working in a service-led workplace the old “the customer is always right” mantra is drilled in from the get-go – no matter how bad, wrong or indefensibly ill-mannered said customer might be, but if there’s one industry in which the adage really stretches the friendship, it’s hospitality. Trust me, there’s a reason your waiter wants your tips – after cleaning up the messes of feral kids, being hit on by lecherous drunks, and obeying the endless dietary whims of weight-conscious, joyless gluten frauds all week, there’s a very good chance they’ve earnt them. One of the industry’s other big gripes is the rising trend of the no-show: people who book a table and don’t turn up, without bothering to let the venue know. As a diner, it may not feel like a big deal to change your mind and blow off a restaurant booking at the last minute without calling, but according to restaurant booking site Dimmi, it’s an epidemic that is said to be costing the industry an estimated $75 million per year. To help combat the issue, last year Dimmi decided to take a firm stand by allowing restaurants to blacklist Dimmi users who fail to honour their reservation. In the last 12 months, Dimmi partner restaurants have blacklisted more than 38,000 diners, up from around 3000 the previous year. The company’s founder and CEO, Stevan Premutico, says the average diner doesn’t realise the consequences. “The majority of people don’t understand the impact that no-shows have on the restaurant industry. They think somebody else is going to make up that booking, but that’s typically not the case,” he explains. For small businesses already working on tiny margins, keeping tables full is crucial. The combination of low profit margins, high wage costs and high staff turnover make running a restaurant a precarious balancing act. That 30-second phone call can be the difference between a business wasting a table, losing revenue and sending staff home early or, alternatively, them re-booking it and staying afloat financially. But despite all this, most hospitality professionals are in the industry because they get a kick out of showing diners a good time. “These stories of bad customer behaviour might sound really terrible, but thankfully they are rare,” explains veteran Melbourne restaurateur and industry advocate, Matteo Pignatelli. “I truly love 98 per cent of my customers, and I’m extremely grateful because these people come to us rather than the thousands of other restaurants around town.